– Coffee hasn’t taken yet? – Well, It’s the third cup, so there’s a chance…. What’s the question? – Planning discourse contribution credit points. Remember the other day, there was a lively discussion here about the credit points in that planning discourse platform you guys — I mean Abbé Boulah and his buddy up in town have been cooking up — and I’ve been telling my email friend over in Europe about it. He is politely asking to get to know more about it, but I have a feeling he’s, well, not outright against it, but very skeptical about the idea. – Well, I wouldn’t blame him; it is a bit involved, if you’d try to apply all parts of what it might be used for. Any feelings about what specifically is bothering him? -It could be that I haven’t been able to explain it well enough; the discussion was mainly about the use of those credits outside of the planning discussions itself. The idea of those credits replacing the rile of money in the political process. I got the impression he sees it as elitist. So he may have lost sight of their basic purpose in the planning discourse itself, that as I understand it establishes their value in the first place. So maybe you can help me go through the basic benefits or uses of those points from the very beginning of the process? What they are for, again? – Well, I’m glad you’re asking, because since that discussion, I’ve gotten kind of confused about it myself: it can get kind of complicated, and there are some questions that aren’t quite worked out yet, as far as I can see. So it gives me the chance to clarify things in my mind as well, I hope. As that old German professor said that Abbé Boulah keeps invoking: If you are not quite certain about something, it helps to give a lecture about it. Or better, a discussion, so you can interrupt and ask questions any time it’s getting derailed. – Hmm. Let’s see. So we assume somebody has raised an issue, started a discussion about some problem or plan that needs attention; asking that something needs to be done about it, because it’s an an issue that affects, bothers, hurts many people in different ways. A community problem, perhaps even in a community that isn’t clearly defined — in that people in several different governance entities — state, countries — are affected and not at all clear what can be done about it and who is supposed to do it. And we optimistically assume that there is something like that discourse platform where all that can be discussed, eh? – Well, there’s got to be some talk about it, whether it’s properly public and organized is a different question. Now the first thing that needs to happen is to get the information about that issue. What’s going on, who is getting affected, and how? And who has the knowledge, — call it expertise or just common sense — about what could be done about it — and then how that in turn would affect people. The common cry and demand is for public ‘participation’. The principle is that all the concerns of all the affected and interested parties must be brought into the discussion so that that can be given ‘due consideration’ in making plans and decisions, right? – Right. Shouldn’t that be a matter of course, by now? – Sure. Well, governments don’t seem to like it much. But it’s also a bit of a problem for the public. You can make all kinds of provisions for citizen participation, but the fact is that that requires time and effort on the part of those citizens, time and effort that the ordinary citizen doesn’t always can afford and doesn’t get paid for, right? And some folks may have their suspicions about whether and how their concerns will actually make much if any difference in the decision. So shouldn’t there be some incentives — for everybody who has something meaningful to contribute to the issue, to contribute that information? – Hmm. I see the problem: you can’t do it with money, it isn’t in anybody’s budget yet. So you are saying that it should be done with those credit points? – Yes. At the very least, there should be some form of public recognition, appreciation for bringing in pertinent information. So you’d reward any such contribution with a ‘civic credit’ unit. And that credit should actually be ‘worth’ something, not just an empty and useless gesture. We’ll get to that later. – Oh boy. That looks like more of a problem than a solution to me — now everybody comes in with all kinds of silly information, all the same ‘concerns’ or demands — what a mess. – You are quite right. That’s why full credit should be given only to the first entry of the same essential content — not to repetitions of the same point. This provision, incidentally, serves another purpose besides keeping the mass of incoming information manageable: it encourages people to enter the information fast, not to wait and let the discussion go around in circles missing a vital item of information. – Okay, that makes sense. But is it a problem that some people who have made an effort to enter information but don’t get it in fast enough, will be annoyed at having their effort ignored? – Good point. This makes it supremely important to have a good public display of information entered, updated as fast as possible, ideally of course, in ’real time’ so that a new item is instantly seen the moment it’s posted. The technology for doing that is available today, but if you want to allow information to get entered by different means — letters, phone calls, email etc. there will necessarily be some delay in getting it posted. So if there’s such a delay, you may want to have people who enter the same point before it gets posted for everybody to see, share that reward. – Ah, I think I see what bothers you. It looks like something like restricting people’s ‘voting rights’ or ‘rights to free speech, does it? Yes. That impression would be bad, not necessarily justified. There must be a clear distinction between entering an information item, and making it ‘count’ in the decision. As long as decisions are made on the basis of vote counts, that impression is understandable, sure. But what we are after, is to reach decisions based on the merit of the information, not just on the number of votes — votes that may be un-informed , ill-informed, or deliberately ignoring the concerns of many other parties — the losing minority of the voting process. And to determine the merit of a piece of information or argument pro or con a plan, it only needs to the stated once. But now we have to deal with the issue of the method by which the merit of a piece of information can be determined. – Yes. Just another question, before we get into that: what about intentionally ‘bad’ information? Wrong or unintentionally ill-informed claims, as you said — even deliberately false, misleading, confusing information? Trolls? Obscene language? Shouldn’t there be some boundaries on that in public discourse? — You agree, Vodçek? – Well, Sophie, my responsibility as the keeper of this establishment is a little different than what’s going on in a public discourse. See, I am very much in favor of freedom of speech, in principle. But I also have a great interest in keeping this tavern somewhat civilized. So here, I feel entitled to ask people who start that kind of thing to please shut up or leave, before it degenerates into physical brawls. And I’m using my personal judgment on drawing the boundary, such as it may be, and I’m okay with some people thinking it’s not strict enough, and others steamed up about my stuffy old-timer attitude. Now in a public discussion, I’m not sure my standards should be imposed on everybody. So who’s entitled to set those standards? In fact, shouldn’t everybody have the right to publicly make fools or buffoons out of themselves? – Huh. Never looked at it that way. Some people seem to get a kick out of doing that. A right to offend? – I think Vodçek has a point there, Sophie. Whether you want to call it a right or not. But the platform process is actually dealing with that in a different way. It doesn’t try to finagle the distinction between acceptable and unacceptable entries — by language or content. So it accepts all entries as they come, stores them and makes them accessible in what it calls the ‘Verbatim’ file. And it acknowledges an entry as a contribution with a ‘point’ that is not much more than that: an acknowledgement: You participated. But then it gives all the other participants the opportunity to respond to it, either by making another verbal entry, or by assigning the original — offending — entry a judgment score. One on a scale of, say, minus 3 (for totally offensive, unacceptable, useless) to plus 3 for totally valuable and proper content. So if there is an actual ‘account’ for those contributions, that contribution point will add to — or diminish — a person’s public credit account, as judged by the public, by all participants in that discourse. – Well, how will that be done? Are you saying that everybody gives every such contribution a judgments score? – That would be one way, or a first step towards such a credit point account. Sure, it’s a little more involved that the current practice of ‘liking’ or adding another kind of emoticon to a person’s comment. But some such evaluation, actually a somewhat more specific evaluation, will be necessary further on in the process if the participants are going to be serious about getting a decision based on the merit of all contributions. Then the adjustment of a person’s initial entry will just be result of that systematic deliberation. – Sounds good, but you’ll have to give me some more detail about that, Bog-Hubert. – Patience, Sophie. First let me ask you, were you here to listen to Abbé Boulah about his buddy’s method for evaluation planning arguments? – You mean that story about looking at all the premises of those arguments and giving them plausibility scores? – Right. Plausibility scores, on a scale of -1 (for ‘totally implausible’) to +1 (for ‘totally plausible, virtually certain) and the midpoint of zero (for ‘don’t know, can’t judge without more evidence…). But also weights of relative importance of all the ‘ought’ premises in the entire set of arguments pro and con a plan proposal. That one would be on a scale of zero (for totally unimportant) to +1 (for totally important) such that all the weights of all the ought-premises in that set of arguments will add up to 1. – Right, I got that part. I remember there was some math involved in getting from that bunch of scores to an overall measure of plausibility of the plan being discussed — I’m not sure I really understand that. – We can go over that part separately some other time. Can you have some faith, for now, that some such equations can be developed that explain how your overall plan assessment should depend on those scores for the argument premises? – Well… I’m not sure I’m ready for buying that cat in a bag, but let’s hear the rest of the story about the credit points. – Okay. 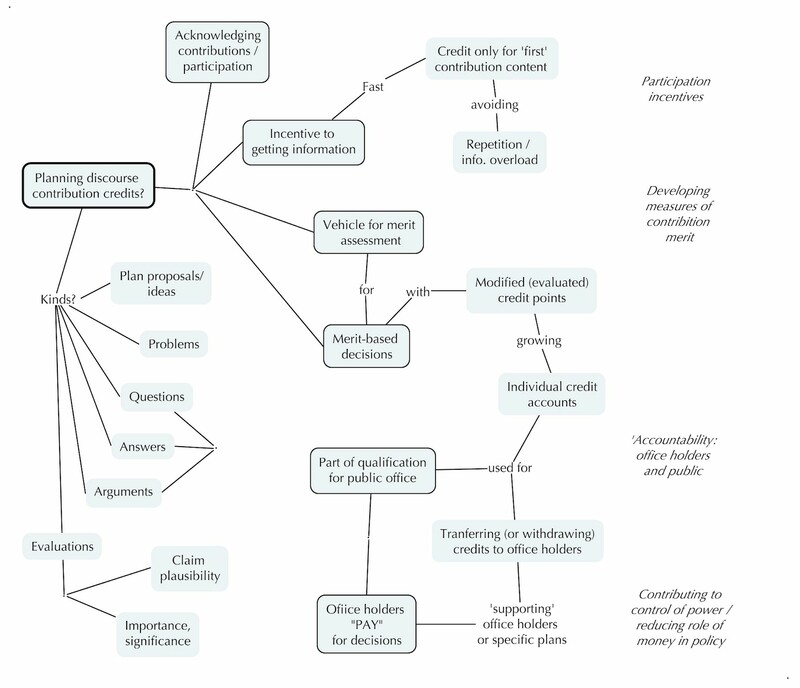 Remember, a person’s comments to the planning discourse, that is, to a discussion about whether a proposed plan should be adopted for implementation, can be roughly distinguished as three kinds of claims, premises, of arguments: One that claims that the plan A (or some plan detail) will lead to some outcome, result, consequence. B, given some conditions C. Another claim is about whether B ought to be aimed for or not; and the third is about whether the conditions C under which A will produce B are actually present or will be present when the plan is implemented. – Yes I remember now. And the plausibility and importance scores actually are judgments about the merit of those claims — is that what you are saying? – Bravo! That is precisely it: those assessment scores are another way of saying how much someone’s comment providing those claims is worth, in that planning discussion. So if we now get some overall statistic of the whole group’s assessment scores of those contribution items, we are not only getting a measure of that item’s merit or weight towards the group’s plan decision, which is also a measure of that entry’s merit in the entire discourse. And the original ‘credit point’ acknowledgement can now be adjusted up or down according to those scores. If the scores as plausible, truthful, supported by evidence, and the ought-premise is important, the entry credit will shift from just ‘present’ upwards to a positive value, but if the claims are less credible, untrustworthy, the entry credit will become negative. – I see, It’s beginning to sound interesting. But won’t everything now depend on the math shenanigans you’ll use to add up or whatever you are doing to the scores? – True. But as we said, let’s assume for now that this can be made to work. Because then, there are more interesting things that can be done with these credits. – Fine. Where were we? Okay. With a little help from our computers, we have calculated the overall judgment scores for the proposed plan, from all the personal scores of discourse participants. And along the way, the computer has stored and used all the judgment scores for the set of argument premises that the participants have made. So we can also calculate the group scores for each premise judgment, don’t you see? And that would be one way to express the value, the merit of that piece of information in the opinion of that group. So now the original contribution credit can be adjusted up or down according to that score. – Ah, I see. So that will become part of the contributor’s credit point account. And you think that will be some kind of encouragement to make valuable, constructive comments? – Yes. And discouraging information that is misleading, false, unsupported by evidence or further plausible arguments, that will reduce your credit account. – So why should people care about that? Is that account made public? – Good question. I guess that needs to be discussed, or left to each participant to decide, whether to make it public or not. But the real question is how that account can be really useful to a person, other than giving them the personal satisfaction of having made useful contributions. Can you think of ways that could happen? – Credit points influence on overall decision? – Well, now that you mention it: would it make any difference in how the decision is made for the plan? – Hmm. I guess it could. It depends on how each decision has to be made, legitimately, in each case. You could argue, for example, that the total public score for a plan should determine the decision. In the sense that if that final score is positive (somewhere between zero and plus one, or above a threshold that must be agreed upon, the plan is approved. If it falls below that, it’s rejected? Then, of course an individual’s contribution merit will be part of that final score. – But that’s not very visible, right? I remember those equations or ‘aggregation functions’, I think you called them, to somehow add up all the individual judgments to some overall score and then to a group score? – Yes, that part needs discussion, sure. For now, let’s say that this overall score is just a recommendation to guide an official’s decision or elected committee’s final, traditional yes/no vote (that may be mandated by law or constitution), then somebody might suggest that the vote of each member of the voting entity could be ‘weighted’ according to that person’s credit score: If you have a high contribution credit score, your vote could be ‘worth’ more than the vote of somebody whose credit account is low or negative because of a lot of bad contributions to public discourse. Okay, okay, don’t hit me. That calls for a lot more discussion, and perhaps agreements in each case. But it offers some interesting possibilities that do need discussion, don’t you agree? – Interesting, yes. I’m not sure I see how it would really improve things, perhaps I need to look at some actual examples. By the way, isn’t this why my friend was worrying about this scheme being, wait, what did he call it: some kind of meritocracy? Is that bad? – Well, it’s a valid concern if in a society power and income is going mainly to people who have been declared as ‘meriting’, at the expense of all the other folks who never evened a chance to build up a merit for anything. Where ‘merit’ is mainly measures in financial terms. The kind of measure we are talking about here is a very different thing, isn’t it? Actually moving away from the power of money, wouldn’t you say? But I’ d say there is an issue of balancing the concern for getting decisions based on the merit — value, truth, plausibility, appeal, quality — of information brought into the discussion about plans, and making sure that the concerns of people who don’t have the time or opportunity to earn those credits aren’t being neglected. – Yes, Bog-hubert: balancing is the problems sounds like the key. I agree that this open planning discourse platform seems to aim at making that easier. The concerns may be articulated and entered into the record to be considered by representatives of people who can’t do that for themselves for one reason or another — children, people too worn out by their work to get as well-informed as the democratic ideals want us to assume. But maybe there should be more robust safeguards to ensure that the meritocracy aspect doesn’t get out if line? – Now, those issues were all potential uses ‘within’ the discourse about a specific plan. Perhaps looking at how your contribution credits might be used ‘outside’ the particular project, in general, might be more useful? – Well, think about it. Your financial credit score makes a difference in your ability to get a mortgage or a business loan. Could your public discourse contribution credit score make a difference in landing a job, say, or a public office? As part of your qualification for such offices? Sort of indicating how much you can be trusted to use sound judgment in decisions that can’t wait for a lengthy public discussion? A more quantitative indicator of your reputation? – I see, yes. People are looking at a candidate’s voting record in previous positions, already — but that can be misleading, not very clear information. So yes, such a contribution credit record may be useful. – Hey, I’m not so sure about that. One way of looking at it is how single incidents can destroy years of apparently trustworthy behavior and judgments: Like your famous Zinfandel: One glass of Zin poured into a sinkful of dishwater doesn’t do much to the essence of dishwater — but what do you get if you pour one glass of dishwater into a bottle of Zin, eh? One big case of defrauding Medicare by millions of dollars should make you ineligible for any job in the government’s health departments, shouldn’t it? – Well. Those details must be ironed out, but I’d say that’s one way your credit account can be come ‘fungible’ — worth something, in everyday social life. Can you think of other ways? – I think I need more coffee to cope with all these unusual issues. Vodçek, can you help with that? Too early for Zin, anyway, after that story of yours. – Sure, Sophie, here you go. I remember hearing Abbé Boulah mention some real unusual ways to apply that credit account — something about making officials pay for their privilege to make decisions? – Right, I heard that too. I thought he and his buddy were really going out in utopia-land with those ideas. But it’s sticking in my mind: If you really are looking for ways to get some better control of the role of money and the temptations for less than beneficial public use of its power in public governance: do you see many promising innovative ideas out there? Better ideas than the traditional venerable ‘balance of power’, term limits, re-election, and in the extreme: impeachment tools? That all are more and more losing their effectiveness to the power of money from the private sector that is undermining those provisions? Because they don’t cover the relations between private sector money and public controls well enough? – Well, how could ‘paying for decisions’ make a dent in that? You are making me curious. – Okay. See, It’s really based on a different understanding of power. It’s not only the ability to make important decisions about your own life — where we call it ‘empowerment’, as a good thing, right? — but also about projects that involve others, that are too big for just one person to decide for themselves. So what if we look at the desire for power as a human kind of need, just like the need for food and shelter? Getting those are considered close to human rights — but we make folks pay for them. So why should we treat power differently from those needs? But we also need to find better ways of preventing power from becoming addictive and abusive. Now, can we say that the general social concern regarding needs is to first make sure that people will be able to earn the means to satisfy those needs, that is, to p a y for them, and then actually make them pay. So why not apply that pattern to the power issue? – But but. Yes, I hear you: Pay? But with money, no: that would just dig our hole deeper? Well, perhaps we can use a different currency? Now that we have one: what about paying for public power decisions with your discourse contribution credit points? The more important a decision, the more points you need as an office holder, to make it. And you use up your credits with each decision. There might be a way to treat it like a kind of investment by providing a way to earn credits back with the public appreciation of successful, beneficial decisions, which means that if it was a poor decision, you lost your credit investment and some of your power to make more decisions. If it’s all gone: time to step down from the power office, hmm? – What about decisions that require more credit points than a single person can ever come up with? – Hey, great idea! Perhaps I could even specify the kind of programs and decisions my points should be used for? – Power to your kind of people! Yes! There might be a way to build that into the system — with the possibility of your taking your credits back if the person makes decisions you don’t approve of, huh? – Bog-Hubert, Sophie, do I have to point out to you that this devious scheme will make you, the supplier of credit point power, just as a c c o u n t a b l e for the decisions you support? Because you too, would lose your points for poor decisions? With the possibility that you too might lose your credit investment in an incompetent power holder? – Trying to scare us now, Vodçek? Yes, it makes sense: I guess it will make people more careful with their credit point contributions, besides being able to ‘punish’ politicians who win elections with promises like ‘no more taxes’ but then go ahead and raise taxes anyway once they are in office. If you can withdraw your credit points, that is. – Yes: If your glorious leader has squandered all his own and your points on lousy decisions, there may be nothing to get back. Unless we can make those fellows go back to regular status to earn more points to pay back their credit point debts… I guess the point is: all the talk about power and accountability is rather meaningless without an account whose wealth you could lose is you use your power unwisely or irresponsibly. – This is getting way too futuristic to have a chance to be realized any time soon, Bog-Hubert, don’t you think? – Well, that’s what they said about those crazy fools who said let’s build flying machines… Abbé Boulah says that the technology for doing these things is already available, so now it’s just about working out the details, getting the system programmed and set up, and getting public support for putting it into practice. But perhaps there are better ways to do those things — public planning discourse, better control of power, — could better ideas be triggered into the open by the very outrageous nature of these proposals? – Sounds like what we need as a first step is that planning discourse platform itself, to run the public discussion needed to reach agreement about what to do. And to work out the details? – Couldn’t have said it better myself, Sophie. To prevent people in positions of power from falling victim to temptations of abusing their power, better controls of power must be developed. A public projects ‘bulletin board’ announcing proposed projects / plans, inviting interested and affected parties to contribute comments, information, not only from knowledge bases of ‘documented’ information (supported by technology) but also ‘distributed, not yet documented information from parties affected by the problem and proposed plans. The platform encourages representation of the project’s problem, intent and ‘explanation’ from different perspectives. Systems models contribute visual representation of relationships between the various aspects, causes and consequences, agents, intents and variables, supported by translation not only between different languages but also from discipline ‘jargon’ to natural conversational language. 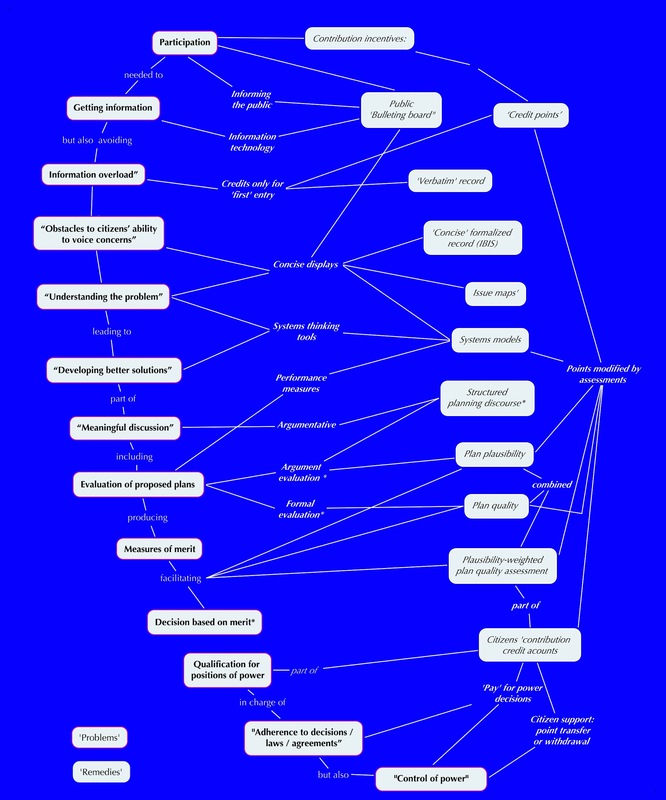 While all entries are stored for reference in the ‘Verbatim’ repository, the discussion process will be structured according to topics and issues, with contributions condensed to ‘essential content’, separating information claims from judgmental characterization (evaluation to be added separately, below) and rhetoric, for overview display (‘IBIS’ format, issue maps) and facilitating systematic assessment. Systematic evaluation procedures facilitate assessment of plan plausibility (argument evaluation) and quality (formal evaluation to mutually explain participants’ basis of judgment) or combined plausibility-weighted quality assessment. The evaluation procedures produce ‘judgment based’ measures of plan proposal merit that guide individual and collective decision judgments. The assessment results also are used to add merit judgments (veracity, significance, plausibility, quality of proposal) to individuals’ first ‘contribution credit’ points, added to their ‘public credit accounts’. Not all public governance decisions need to or can wait for the result of lengthy discourse, thus, people will have to be appointed (elected) to positions of power to make such decisions. The ‘public contribution credits’ of candidates are used as additional qualification indicators for such positions. Better controls of power can be developed using the results of procedures proposed above: Having decision makers ‘pay’ for the privilege of making power decisions using their contribution credits as the currency for ‘investments’ in their decision: Good decision will ‘earn’ future credits based on public assessment of outcomes; poor decisions will reduce the credit accounts of officials, forcing their resignation if depleted. ‘Supporters’ of officials can transfer credits from their own accounts to the official’s account to support the official’s ability to make important decisions requiring credits exceeding their own account. They can also withdraw such contributions if the official’s performance has disappointed the supporter. This provision may help reduce the detrimental influence of money in governance, and corresponding corruption. One of the duties of public governance is ‘enforcement’ of laws and decisions. The very word indicates the narrow view of tools for this: force, coercion. Since government force must necessarily exceed that of any would-be violator to be effective, this contributes both to the temptation of corruption, — to abuse their power because there is no greater power to prevent it, and to the escalation of enforcement means (weaponry) by enforces and violators alike. For the problem of global conflicts, treaties, and agreements, this becomes a danger of use of weapons of mass destruction if not defused. The possibility of using provisions of ‘credit accounts’ to develop ‘sanctions’ that do not have to be ‘enforced’ but triggered automatically by the very attempt of violation, might help this important task.